“Immersion.” It’s become a meaningless buzzword in video games because it represents a dream. We might scoff when it’s applied to the latest Battlefield or whatever, but “Immersion” remains a driving force in the industry. We want to feel like we’re there, like these digital worlds are real. In virtual reality we speak of “Presence,” which is really just immersion by another name. But at a fundamental level, games play much the same in 2018 as they did in 1998: We sit at a PC with a mouse and keyboard and watch images on a screen. VortX promises to change that, though—at least one small facet. 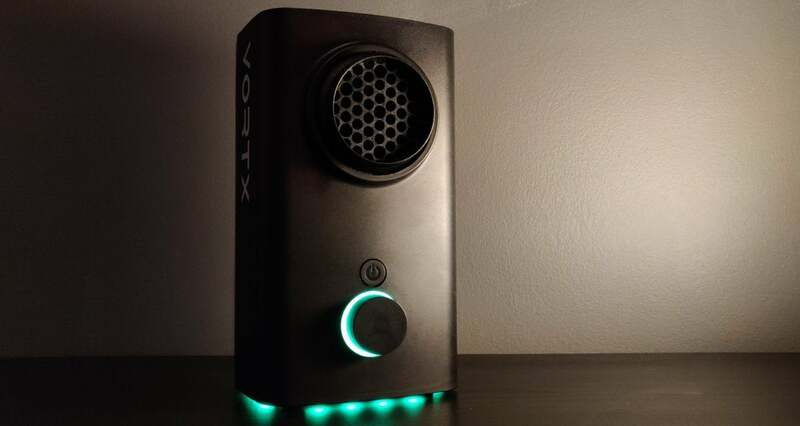 Billed by its creator Whirlwind FX as “the world’s first environmental simulator for PC gaming,” VortX analyzes the action on-screen and blows wind on your face to match. I knew we had to try it, but would it work? Or would VortX prove just a lot of hot air? Sadly, it's mostly the latter. I’ll say this for VortX: It’s an attractive device. Over the years I’ve tried other experimental haptic devices—gloves and vests to simulate touch, and even a box that generated smells. But they were all prototypes at best, barely functional and replete with naked wires. Not something you’d sell to consumers, in other words. VortX looks like a finished product, though! It’s enormous, measuring maybe a foot tall and six inches to a side. It’s definitely a presence on my desk. Nevertheless it looks high-end, resembling nothing more than a miniature subwoofer, a black rectangle with a grill-covered vent on the front, a power button, and a control dial, with the VortX logo in silver on the side. And because it’s a modern gaming peripheral, it lights up of course. There’s RGB LED underglow on the front and sides, plus a ring of light around the dial. Taken together, it indicates a device with a lot of love and care put into its design. You can’t judge anything purely on looks, but VortX postures like a true consumer-facing product. “Haptics aren’t just an experimental niche for the future, they’re happening now.” That’s the intent I read from VortX’s design. It doesn’t mean intent and reality line up. Virtual reality, for instance, saw a similar disconnect. Oculus in particular built a beautiful piece of hardware with the Rift headset, proof that VR was happening now—but nearly three year’s on it remains a niche. VortX is destined for the same fate I think, but it’s proof people are trying. Maybe it catches the right people’s eye, maybe money pours into the space, and maybe in 10 or 15 years we’re reviewing “environmental simulators” the same way we review mice and keyboards today. Or maybe Whirlwind FX proves resilient, carving itself a niche from nothing. Maybe. For the moment all I can do is review VortX as it is though, and that’s a trickier proposition. You plug VortX into both a power outlet and a USB port to start, then download a software utility from Whirlwind FX’s website to get it up and running. It’s worth mentioning the software side is also well-designed, simple and unobtrusive. There are three main settings to play around with: Intensity, Heat, and RGB color. It’s pretty self-explanatory. VortX reads the action on-screen and any related audio cues, then tries to blow air on you to match. Start sprinting and you’re likely to get a cool breeze wafting on your face. But, and this is the most interesting part, if the algorithm detects the color red on-screen and maybe a bass-laden fire noise, it reads as a heat source and blows warm air. Stand next to a burning tank in Battlefield V for instance and you’ll feel a hot breeze, sort-of like a low-scale blow dryer on your face. There are moments where you can really see the potential for VortX or devices of its ilk. Battlefield is truly a best-case scenario because there’s a lot of action taking place—sprinting, flying a plane, parachuting, bullets flying overhead, explosions, fires, and so on. When everything aligns and VortX perfectly replicates the blast of heat from a nearby explosion, or the cold breeze before you leap from a C-47 over Norway, you feel (for lack of a better word) immersed. This is definitely first-generation hardware though, with first-generation hardware woes. First and foremost: It’s loud. So damn loud. VortX is basically unusable without headphones, its fan kicking up to full-speed every few seconds. It’s key to how the device functions, right? But that doesn’t make it any less distracting. Worse, there’s a high-pitched squeal every once in a while, I think from the heater coils alternately warming and cooling. It’s even more racket than the fan itself. Okay, so you wear a headset. Small sacrifice for a better experience. “Better experience” is questionable though. Even at its best, VortX only works maybe a quarter of the time. The algorithm VortX depends on at the moment is extremely simplistic, from what I can tell. Motion on-screen is registered as a fan blast, and the presence of red indicates heat. There’s also an audio component, with bass-heavy noises generally tied to warm air while a high-pitched noise might indicate sprinting (cool air). That’s about the extent of it. On the one hand, good on Whirlwind FX for making a universal device and not relying on developers to implement a proprietary SDK. That’d make VortX dead on arrival. The current algorithm is prone to all sorts of misfires though. Turns out there’s a lot of red in the world that’s not heat-related. Red lights, red hair, red blood, red cars—I’ve had them all register as heat sources while messing with VortX, despite Whirlwind FX saying a lack of heat-related audio cues should prevent this from happening. Simple motion-detection can be just as error-prone though. My favorite example: At one point I left VortX on while not actively playing a game. 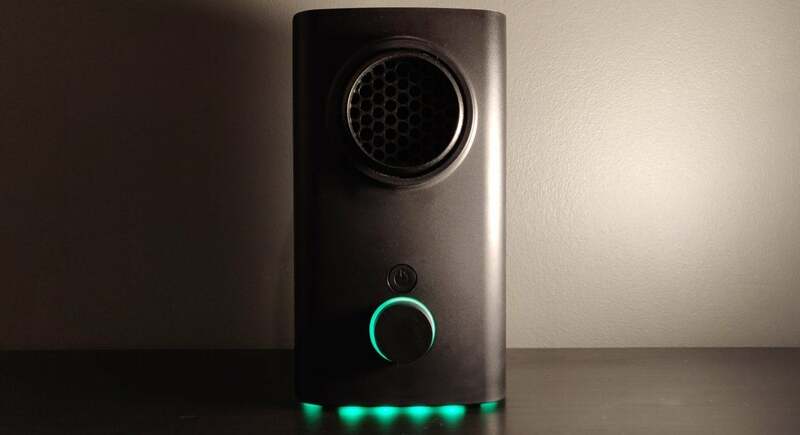 I wouldn’t recommend it, because VortX makes a quiet-but-high-pitched whine even when not in use, but I’d forgotten to turn it off after exiting. Then I scrolled a webpage and whoosh, VortX started blowing air on me. Motion, right? Time for a breeze. That one made me laugh, but in-game VortX has just as many issues. As I said, the success rate is maybe 25 percent—and that’s in a first-person game like Battlefield where VortX makes the most sense. Even so it has a hard time figuring out if I’m sprinting sometimes, or how fast a vehicle is moving, or if a quick camera spin should register a blast of air or not. And in third-person games, forget about it. I left VortX up and running for a bit while reviewing Darksiders III and Just Cause 4, but in both cases the algorithm just had too difficult a time figuring out what was going on. I experienced lots of wind while standing still, then sometimes none at all while gliding through the air or sprinting. Explosions still worked great in Just Cause 4—VortX can figure that one out at least. But the rest is hit-or-miss. I’d also love it if Whirlwind FX figures out the pungent chemical smell the heater sometimes puts out. It diminished over time but even after a few weeks I still get the occasional blast of burning...something. Not great. When it works VortX is pretty cool, but as soon as the illusion breaks it’s either distracting or, worst case, annoying. That’s always the problem with early adopter tech—trying to showcase the potential while minimizing the current hardware flaws. VortX does the former, but it also has a lot of flaws and needs many more iterations before it’s ready for general consumption. My fear is Whirlwind FX won’t get another shot. Companies structured around these experimental product niches generally get one chance to prove the concept. VortX failing might kill the whole endeavor, leaving us bereft of so-called environmental simulators for years to come. It’s not my job to worry, but as a gamer with an interest in these ideas I do anyway. Still, it’s hard to recommend VortX at the moment and that’s what ultimately matters. It may look like a consumer-ready product, but underneath the polish this is still a prototype at best.